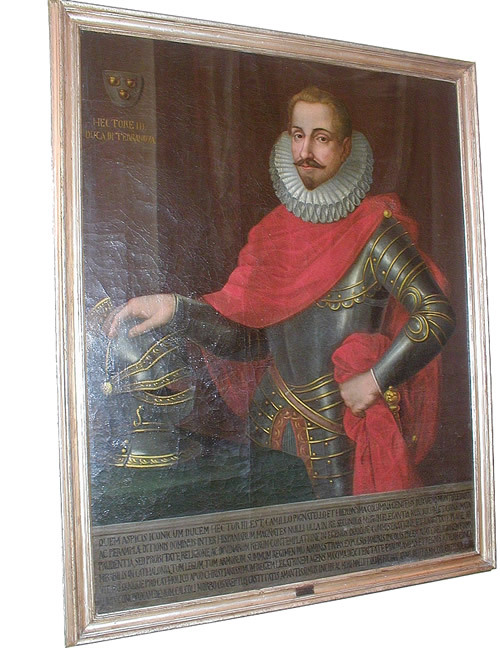 Capitano Generale of Catalogna appointed by Philip III Habsburg of Spain , in 1609 in Valencia was a major player in driving out of Spain the Moors. Maggiordomo of the Infanta Donna Anna daughter of Philip III, in 1615 escorted the Infanta in France , for the marriage with Louis XIII Bourbon King of France . While his stay in France made a consistent contribution in the reconciliation of the Duc of Nevers Charles de Gonzague and Maria de' Medici Queen Mother with the King. When he returned in Spain was appointed in 1616 member of the Supreme Council of the King Philip III of Spain . He died in 1622 under the Reign of Philip IV Habsburg of Spain. He married Caterina Caracciolo Countess of S.Angelo dei Lombardi with fiefs in Nusco and Cerignola. Fabrizio Pignatelli Marques of Cerchiara. b)Angelina Nun in the monastery of S.Andrea in Naples. married Francesco Caraffa Duc of Nocera.